The Bills had a couple of players who were not on the field at Buffalo’s mandatory minicamp. Two were players still rehabbing offseason procedures in Chris Williams and Aaron Williams. The third player had trouble traveling back to Buffalo. That according to head coach Rex Ryan, who explained Seantrel Henderson’s absence Tuesday. As for Chris Williams, who has not been in attendance for any of the OTA practices, but was in the building Tuesday rehabbing, Ryan made it a point to speak with him at length. Ryan said he expects to see Henderson back on the practice field Wednesday. There were a couple of changes on Buffalo’s Thursday injury report concerning a pair of starters on offense. WR Robert Woods, who was limited Wednesday after sustaining an ankle injury, did not practice at all Thursday. “Right now he wouldn’t be able to play,” said head coach Doug Marrone. Meanwhile starting LG Chris Williams was limited in practice with a back ailment listed, but Marrone said it was a proactive precautionary move, not a reactionary move to an injury. “He went throughout the practice we just watched his reps,” said Marrone. Well Bills fans the regular season is here. Let’s hope Buffalo can get off to a good start in Chicago, even though the Bears do very well when they open the season at home (18-3) since 1984. On to your questions from email at AskChris@bills.nfl.net or on Twitter @ChrisBrownBills. How is Chris Williams doing at left guard? Is he getting any competition from any of the other guys? Having signed him as a free agent, is it still possible that the Bills will look to one of their other offensive linemen to take the spot? CB: This is a hard one to answer because he’s been in and out of the lineup so much this preseason. He missed the last three preseason games with a back injury so it’s been difficult to judge any kind of progress in terms of chemistry with his new line mates in games. His teammates have taken well to him and head coach Doug Marrone said he is the unequivocal starter at left guard, even though rookie Cyril Richardson spelled him in the lineup when he was out. Richardson looks like the only realistic threat to Williams’ position in the starting lineup and Williams play would really have to falter for that to happen the way it looks right now. My question is why does everybody from analysts to announcers call EJ a mobile, read option type QB? From what I can tell running is not the strongest part of his game at all. Sure he’s had a few good runs when the defense is in man coverage and it’s wide open but just about every QB in the league can do that. Maybe he’s not being decisive enough and isn’t running full speed, but his acceleration doesn’t seem to be all that which is what I would think is a QB’s best friend when scrambling. When he’s throwing the ball well I have no problem with him being our QB, but it seems to me he’s getting this stereotype which doesn’t fit him. CB: I’m going to assume that you’re referring mainly to TV broadcasters. Unfortunately I don’t hear the television broadcast because I’m working the game too in the press box. If there are a lot of references to EJ being a mobile QB I haven’t heard it. Yes, he has the mobility to make yards with his legs when things break down or to escape a collapsing pocket, but he has even said himself he wants to be a passing QB that can run when absolutely necessary. 3 – @ChrisBrownBills Has Cyrus gotten any looks at guard in practice, or solely at tackle? CB: Cyrus Kouandjio has been working strictly at offensive tackle. I have not seen any reps for him at the guard position. First of all Kouandjio is a very long-limbed player and knowing a guard needs to really win on leverage inside, it may prove more difficult for him than other taller tackles that a coach might want to shift in to guard. Second, it’s clear that the coaches want to get him as many reps as possible at tackle. He just turned 21-years old, he’s still growing into his frame and simply needs time on the job. The more reps he gets every day in practice at tackle the shorter the learning curve gets for him to be ready to contribute. 4 – @ChrisBrownBills will we see vanilla Defense scheme allowing Cutler 6 seconds to pick secondary apart? CB: I think here are two things you need to keep in mind regarding Sunday’s opponent and Buffalo’s defense. First, Cutler never needs six seconds to get the ball out. The Bears offense is largely based on three step drops. It’s very difficult to sack Cutler, which is why Chicago gave up the third-fewest sacks in the league last season (30). All that being said the Bills defense will not be vanilla. I’m assuming you’re referring to how Jim Schwartz often relied on his front four to rush the quarterback in Detroit and routinely dropped seven into coverage. That won’t happen a whole lot this season. The reason why is for the first time in a long time Schwartz has quality cover corners in Stephon Gilmore and Leodis McKelvin, which gives him the liberty of sending extra rushers on passing downs. I’m not certain we’ll see a lot of extra blitzers this week because of how quickly Cutler gets it out, but through the course of the season we’ll see a variety of looks from coach Schwartz. 5 – @ChrisBrownBills Great work Chris! Does #1 on depth chart chart for kickoff returns (Spiller) mean more 1st down touches for Freddy? CB: I would not assume that Fred Jackson will see more first down work following a kickoff return by C.J. Spiller. Spiller addressed that very question this week, so I’ll let him explain why that might only be in the case in a few situations this season. Bills OL Chris Williams didn’t get much of a chance to execute the screen game during his time in St. Louis. It just wasn’t much of a component of the Rams offense. It is however, a staple for Buffalo’s attack. In the few times that the Rams did run the screen game though, Williams was often called upon to get out in front of the backs to block and looked agile and mobile. So Buffalobills.com asked him for his thoughts on the screen game and the likelihood of running it with much more frequency here in Buffalo. By no means am I going to pretend to be a scout, but after looking at three of Chris Williams games at left guard last season for St. Louis there it’s pretty clear why the Bills saw him as an upgrade. Against all three NFC West opponents in Weeks 1, 4 and 8, Williams more than held his own. He had a lot of one-on-one assignments. In Week 1 he squared off against Arizona’s Calais Campbell. In Week 4 he drew veteran DE Justin Smith as an assignment against San Francisco, and in Week 8 faced a host of Seattle defensive linemen and linebackers in the Seahawks multiple look defense. Williams proved consistent at holding his ground in pass protection and sealing off penetrators on run plays. Although the Rams don’t run much of a screen game at all he did show an ability to get out in front of a back on one screen play that the Rams did call. St. Louis doesn’t pull their guards a whole lot either, but in the instances in which he was called upon to do so he showed the feet and agility needed to execute. Perhaps most encouraging is over those three games, and granted it’s just three games, there were no visible busts on his part against three quality defensive units. If there were any blemishes in his performances it might be sustaining his blocks. He fell off a few of them a bit early. His free agent visit to the Bills on the first full day of free agency was a sign that Chris Williams was an early target for Buffalo to fortify their offensive line. Now that he’s in the fold, GM Doug Whaley couldn’t be more pleased. Williams also brings guard-tackle versatility to the offensive line as one of the only guards on the current roster that can also kick out and effectively play tackle in a pinch. Here’s a shot of the GM with his newest guard right after Williams signed. There are a host of reasons why free agent OL Chris Williams chose to sign with the Bills, but it was clear that the prospect of having a former offensive lineman as a head coach played a pivotal role. Still, just 28-years old, the former first-round pick believes he can still improve as a player with offensive line coach Pat Morris and Marrone on the staff. 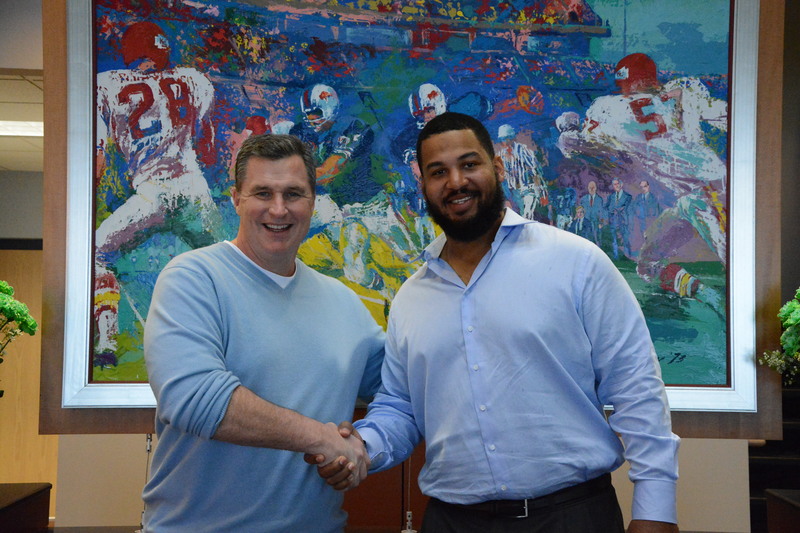 Free agent OL Chris Williams, who is visiting at One Bills Drive today (Wednesday) will apparently soon put pen to paper on a multi-year contract. 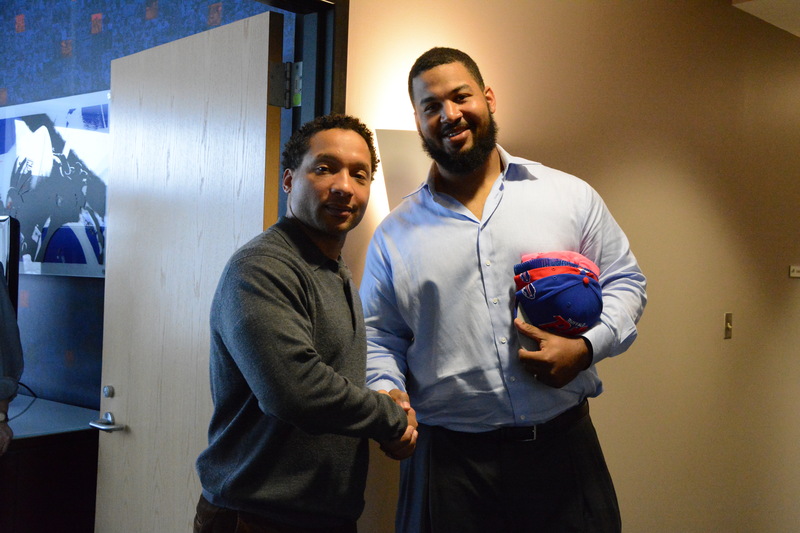 G Chris Williams signing a four-year, $13.5 million deal that includes $5.5 million guaranteed with the Buffalo Bills. The Bills have not confirmed the signing to this point.